Liven up every room in your home or business with the selection of materials from our stunning collections. At our local showroom, we feature a full range of stylish and durable luxury vinyl flooring. With our product selection, you will upgrade your space without overspending on your materials and services. Our goal is to deliver a variety of materials from some of the leading brands in the industry. From great rooms to entryways, you are sure to find something you love to fit any room when you shop with us. Visit us today to take advantage of our stock and schedule a luxury vinyl flooring installation in your space. With all of the options available to you on the market, it can be challenging your new materials. Our consultants are available to meet with you to make the selection process as easy as possible. From colors to patterns, we give you endless options to choose from for your space. When you visit us, our knowledgeable flooring specialists have the products you need to bring your design dreams to life. When you are ready for a change in your home or business, upgrading your flooring is an easy, efficient, and affordable way to achieve your design goals without the need for a lengthy construction process. No matter what part of your space you are looking to upgrade, choosing luxury vinyl tile or plank will allow you to achieve your design dreams. At our showroom, our sales consultants are happy to deliver the right product to fit every space. With our extensive selection of LVF, you are sure to find the right material for any area. Once you choose your perfect pattern, we can provide our experienced installers to take on your luxury vinyl flooring installation. Because we focus on the details of your project, you will not have to spend money on avoidable repairs in the future. Our experienced contractors are able to handle jobs of all sizes and complexities. Whether your goal is to enhance your kitchen, bathroom, or entryway, you will find everything you need for the job at our expansive showroom. If it has been a long period of time since you upgraded your space, changing your flooring out can have a major impact, even in a small room. By adding new floors, you create a new atmosphere that transforms your property with appeal and value. 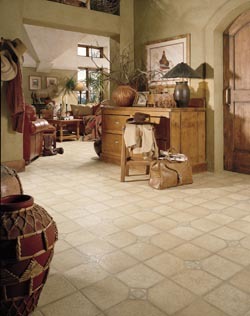 Luxury vinyl tile is known for its ability to mimic high-end materials such as natural stone and slate. Luxury vinyl planks come in numerous species with grain patterns and whorls that look just like the real thing. Contact us to use our luxury vinyl flooring throughout your home or business. We proudly perform a luxury vinyl flooring installation throughout Steinbach, MB; Winnipeg, MB, and surrounding areas.